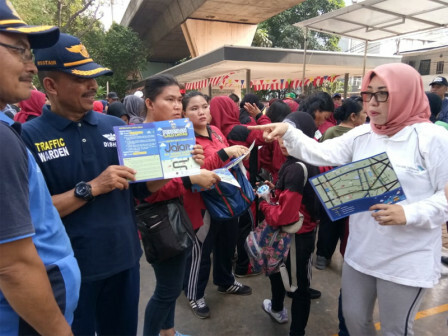 The Central Jakarta Administration is socializing the one-way system plan at Jalan KH Wahid Hasyim, Kebon Sirih, Menteng towards the public.
" Trial stage will begin from October 8-22 at 9 AM"
"It goes into effect on Monday (10/8). Hopefully it can parse traffic jam optimally," expressed Bayu Meghantara, Mayor of Central Jakarta, Friday (10/5). In the meantime, Central Jakarta Transportation Sub-dept. Head, Harlem Simanjuntak stated that it has been ongoing since a week ago to Menteng people, especially the road users who usually pass on Jalan KH Wahid Hasyim. "Trial stage will begin from October 8-22 at 9 AM. We will send our officer to the field during trial," he stated. During the trial, the vehicle coming from Jalan Jaksa towards intersection of Jalan Agus Salim will use one direction from east to west or not be able to turn right from the direction of Jalan Agus Salim - Jalan KH Wahid Hasyim. Vehicle coming from Jalan Sabang will be directed to the south to north. While from Kebon Sirih, cannot pass on Jalan Agus Salim or Jalan Sabang. "It will be applied permanently on October 23, 2018," he stated.